Windows is a great operating system. It’s simple and convenient and just works. However, it is also fairly easy to screw up a Windows installation. Getting infected by malwares is the most obvious and (possibly) common way. But believe me, with so many magical tweaking utilities around, it is not very tough to mess up. FixWin is a portable utility developed by the folks at TheWindowsClub.com, which provides a quick fix to common Windows problems. It includes solutions to fifty problems commonly experienced by Windows 7 users. 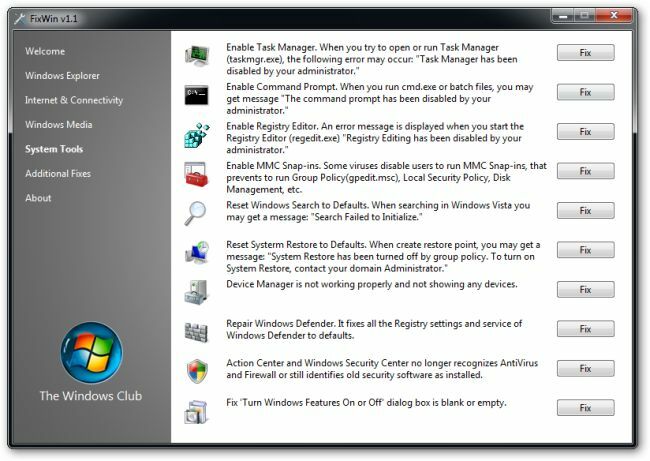 The problems are grouped into five categories – Windows Explorer, Internet & Connectivity, Windows Media, System Tools and Additional Fixes, and include everything from missing recycle bin to locked task manager. In fact, FixWin is capable of doing some of the tasks of Virus Effect Remover. FixWin doesn’t do anything you yourself wouldn’t be able to do. In fact most of the fixes are as simple as changing a single registry key. But, why take the trouble of scouring the internet for solution and digging through the registry when FixWin is offering a one-click solution? Fixwin is one of those utilities which you should always have in your collection. You never know when it may come in handy.